With the EVO Gimbals RAGE3 3-Axis Motorized Gimbal Stabilizer you can stabilize your camera while maintaining focus and exposure control. Three motors stabilize the camera on the pan, tilt, and roll axes. The pan and roll axes both operate at a full 360°, while the tilt axis can rotate 320°. Select DSLR and mirrorless cameras can connect to the RAGE3 via included USB cables for camera and focus control using the built-in focus knob. Additionally, for cine-style lenses with 0.8 MOD gearing and photo lenses with gear rings, a focus motor which communicates with the gimbal's focus ring is included for controlling focus. Both options ensure that you don't have to touch your camera for operating focus or exposure. Regardless of camera brand, you can maintain manual control over your lens' focus using the included Pro-Focus Drive motor. The motor interacts with the built-in focus knob and can actuate focus on lenses that have 0.8 MOD gearing (standard on cine-style lenses and lens gears). On supported camera systems, the focus knob can control the lens' internal focus motor for a more seamless remote control experience. When not using the app, the built-in OLED status display lets you navigate menus, change settings, and monitor battery life in real time. On compatible cameras, the RAGE3's controls can be linked to the camera. When linked, you can manually adjust your aperture, ISO, and shutter speed without touching your camera. 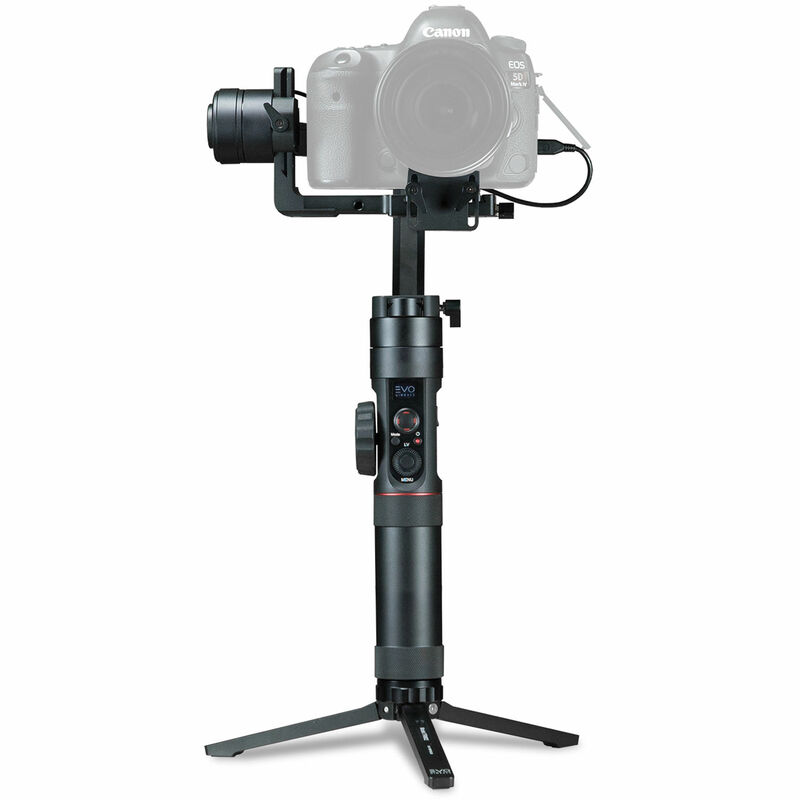 The camera platform uses the same form factor as Manfrotto video quick release plates. Cameras that use compatible plates can be easily swapped in and balanced for use on the gimbal. Box Dimensions (LxWxH) 19.8 x 10.9 x 5.9"
RAGE3 3-Axis Motorized Gimbal Stabilizer is rated 5.0 out of 5 by 1. Rated 5 out of 5 by Edward from Best gimbal ever! This extremely well built, sturdy gimbal was very easy to use and produced amazing stable video. Both still and action every mode worked very well! It passed my expectations! Yes it will, this is the same as the crane 3. Like exactly the same. Only difference I could see was the message on the screen when you power down. All you&acirc;€™ll need is a cheese plate or something like that to offset the pocket 4k. Most of this style of gimbal need something to adjust them. Some gimbals include them, but they are pretty cheap to buy. I have the pocket 4k and this and it&acirc;€™s been working great! Does the gimbal run on all three provided batteries at the same time or is one of them a spare? Yes it does use all three batteries to power the unit. For some reason however, when you buy a set of batteries for replacement or backup, they only sell them in packs of two. A little frustrating, but I guess not a huge deal. Is there any audio frequency interference between the rage 3 motors and the cameras? My Evo pro vs. GoPro frequency incompatibility made audio useless. Nothing but static. I would like to not get burned again. I am pretty heavily invested n Evo accessories, like batteries, handle extensions and such that changing gimbal systems entirely is not an option. Thank you. I have not noticed any audio issues at all created by the gimbal with my camera's on-board mic. I'm using the Sony a7iii mounted to the Rage3 connected with the CCI camera control setup - works great. Then again, I'm not recording any dialog - but only room sounds / reference. I use this setup as a b-roll camera and record dialog or other important audio separately. Can I use this item for the Sony a 7iii?